Anyway, we’re officially past the halfway mark in the year, and I have somehow managed to make it this far without repeating an entire outfit. I’m just as shocked as you probably are right now. Finding something to wear these days is becoming a challenge because I can’t always remember which combinations I have and haven’t worn. Good thing I do these posts every month for reference! Without further ado, here are my looks from June. And if you missed any of my other monthly fashion recaps, you can find them below. I hope your work day is short and stress free! Happy Wednesday! *Linking up with The Pleated Poppy for What I What I Wore, Life in the Green House and Taz and Belly for Wardrobe Wednesday, Sydney Fashion Hunter for Fresh Fashion Forum, Pumps & Push Ups for Oh, Hey Girl! 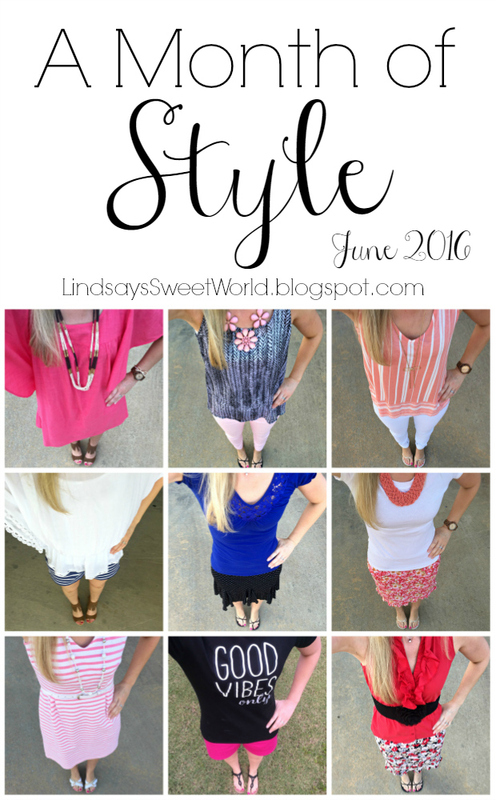 Link-Up, The Mummy Chronicles, Tucker Up, Shopping My Closet for Style Me Wednesday, Classy Yet Trendy for Trendy Wednesday Link-Up, The Blended Blog and Jessi's Design and Going the Distance for What's Hap-"Pinning" Wednesday. Love that June 30th look! That top with the white jeans is super cute. That's such a bummer about the storm last night, but so good that he was doing well for the short time you were there! You go girl...I would have repeated an outfit a long time ago by now. Haha! Those pineapple shorts are the cutest! And you always wear the best shoes! Oh and yayyyy for Jacob!!! SO cute. You have some seriously adorable clothes. So many colors and patterns, I LOVE it. Girlfriend, I love it all - especially all the white! Thanks, Marie! I love me some white during the summer... and the winter for that matter! You wear the cutest clothes! I love those fringe wedges and the outfit you wore them with is perfect! So much cute! I don't even know where to start! I love your shorts! So many cute picks this month! Summer is such a pretty time for colors. And, your jewelry is so on point too! Love it. I love looking through your monthly recaps and trying to find my favorite outfit. I love that pink dress!! Welcome by and linkup with me beautiful. A brand-new linkup is up every Thursday. Thank you!